Zoanthids are quite popular due to the wide variety, general easy to moderate care requirements, and the fact many are captive raised (fragged/aquacultured). 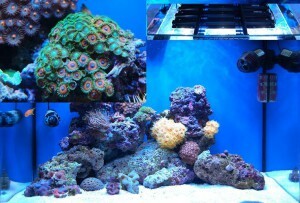 First let me provide some basics of these popular reef aquarium inhabitants. What is a Zoanthid? This is the common term for all members of the Zoanthidae family, including Zoanthus, Palythoa, and Protopalythoa. Zoanthids are Colonial, in other words, each coral is a colony of separate polyps living together. While Zoanthids are photosynthetic, many of these colonial corals will tolerate low to medium light levels. They prefer low to moderate water motion and do well within a temperature range of 76º to 84º F (24º to 29º C). Since Zoanthids are photosynthetic, they survive with no feeding, but occasional feeding of the soupy “upper broth” of prepared or homemade reef diets. Palythoa (aka palys), grow in a mat of coenenchyme with their polyps embedded, just like their cousins the Zoanthus. However, Palythoa use sediment to help reinforce their tissue. In closer inspection, you will see sand, crushed coral, etc. in their tissue. 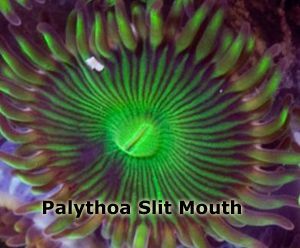 The coenenchyme is thicker for Palythoa than it is for Zoanthus, which is generally observable to touch and to sight. As noted earlier, lighting requirements are generally not high. However this does not mean the good lighting and placement of Zoanthids is not important for thriving colonies. Blue /actinic lighting is also important if only for viewing these beautiful reef inhabitants in all their glory. The TMC Fiji Blue is an excellent choice for this (see the picture/link to the left). An even newer light is the NUV Blue (Near UV Blue). This light provides less useful PUR than the Fiji Blue or similar quality NM LED lights, but has light energy in spectrums not before available in a single LED that can really bring out some colours. This light should only be a part of your lighting scheme due to the very low near UV irradiation. With modern technology, the best lighting choice for Zoanthids are T5, T2 (with T5 or LED blues), or high output LED Aquarium Lights. The LED would be your best choice for this specimen. Among LEDs there are many decorative LED aquarium lights such as the “Ecoxotic Stunner” that are NOT reef capable and should not be considered other than for highlights with already good T5 or other lighting. Among the higher end, most LED’s will work fine for Zoanthids. Although even here the use of the best emitter & driver technology will yield the best results for the least amount of energy consumed & carbon footprint. The Taotronics are on the low end of capable and consume more power. The high end would be the AquaRay LED Aquarium Lights with constantly updated and new AND patented CRee emitters. These use very little power for the light spectrum they provide. Probably the best over all light period, LED or otherwise is the Ocean Blue NP Ultima. This new as of 2013 LED Fixture has an excellent mixture of proprietary Cree and Osram Olson emitters to produce an overall 20k color temperature. What has really impressed me most about this particular LED fixture is the Osram Olson NP Blue which is the first specific emitter designed for full spectrum reef aquarium lighting, rather than adapting current emitter bins to the lighting application at hand. A similar newer yet light is the AAP AquaBeam Coral Colour Plus. This is similar to the Ocean Blue, except it also has Semi NUV and Cree Red emitters. A better LED for color, but a slightly lower PAR & PUR than the Ocean Blue or Reef 2000. Now for a little sales pitch (based on professional aquarium maintenance and design use); The American Aquarium AquaRays latest offering now include the latest generation of PROPRIETARY Cree XR-E, XP-E, XP-G, XT-E, XB-D, & ML-E, as well as the Reef Aquarium specific Osram Olsam NP Blue emitters. This means any buyer of these LEDs will be getting the most bang for their buck without the wasted energy of Taotronics shotgun approach to lighting or the lower efficiency of the Kessil, AI, or EcoTech. As per efficiency, no other LED beats these American Aquarium AquaRays, with an input energy in wattage measured in PAR mml output of as low as .08 watt per PAR mml compared to even other premium lights such as the Kessil & EcoTech as which measure about .30 watt per mml of PAR! Below is a composite picture of an aquarium with Zoas utilizing a VERY early LED aquarium lighting build. These are 2009, first generation AquaRay AquaBeam LED strips (versus now 4th generation as of 2016). As a generalization, using Blue Hornet Zoas as an example; about 6 inches from the sand bed, and about 16-20 inches from the LEDs with moderate water flow. Other Zoas such as the “Blow Pop” Zoa (aka “Neon Eyes” & more) are reported to do better closer to their light source such as only 4 inches from the surface with relatively strong lighting. From my research many, if not most, Zoanthids seem to grow better and exhibit longer stalks in deeper placements. Too much light results in the metallic brightness or other colors fading away. Some Zoas do quite well with mid level placement and some shade from an aquarium live rock reef. 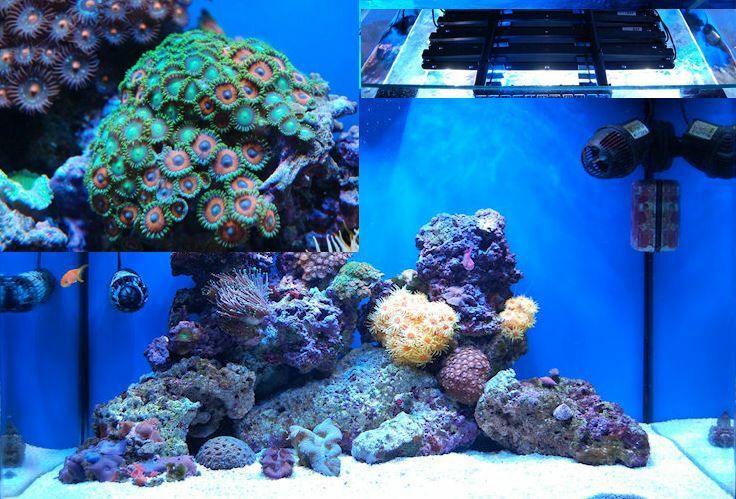 The bottom line is any keeper of Zoas needs to experiment with placement, then observing color, stalk growth or stretching and over all health. I will also point out that wearing gloves (such as surgical gloves) is best when handling any Zoanthid, but especially Palythoa as these can excrete a toxin that is quite poisonous if you have any open cut or sensitive area on your skin. *Purchase Aquarium LED Lighting; What to Know? *Zoanthid, Zoa’s, Zoos & more! even needed by the plant for photosynthesis. *Less wastage of heat: Even after hours of operation such lights are just warm to touch. which are the blue light and the red light.